This is an old family recipe from Brock’s grandmother Lenora (that made for a wonderful weekend afternoon with Auntie Carmen)… basically rolled potato pancakes dressed with butter and sugar (or lemon) and super tasty warm or cold. If you have lots of time then we suggest you make several batches and store the pancakes covered up, in the fridge, with sheets of wax paper in between each to separate them. If you’re only whipping up one batch…then you should definitely enjoy them warm. 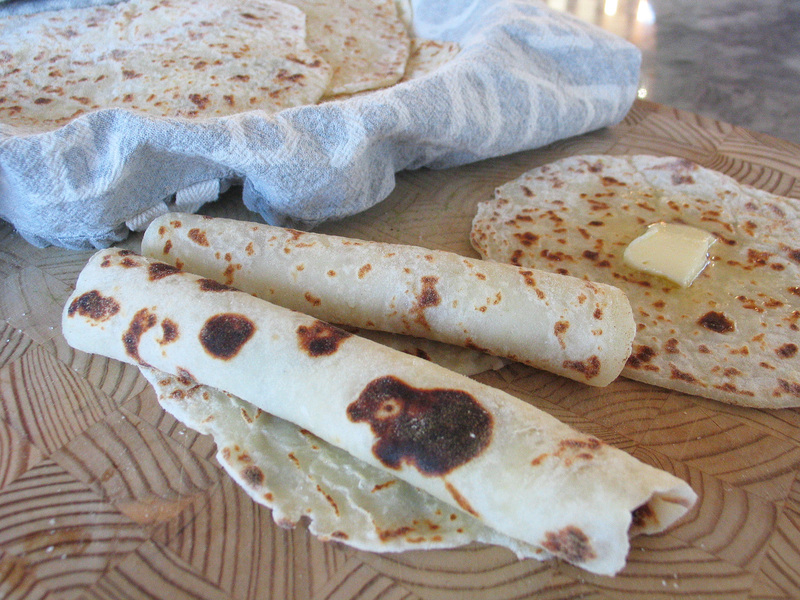 This recipe makes a dozen pancakes – and yes, we own a ricer – it’s worth having one if you love lefse as much as we do! – enjoy! 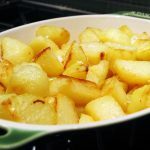 1 c. slightly compacted riced potatoes – boil a couple of russet potatoes until just tender and leave to drain until they are good and dry. Press pieces of potatoes through a ricer until you have enough for your lefse adventure. Preheat and electric griddle to 400 or heat up a non-stick skillet on your stove-top. Mix all of the ingredients together thoroughly (perhaps starting with about a 1/4 cup of flour) , adding more flour as needed if it’s too sticky. Weigh the dough and divide it into 12 even balls (or eyeball it, whatever works for you). Flour your hands, press a dough ball into a flat round patty, and then on a floured surface, roll out each individual patty into a thin 8-inch circle, making sure that each round is an even thickness or the edges will overcook before the middles are done. Cook each individual pancake for a couple of minutes per side until brown spots appear and then turn them out onto a platter and cover lightly with a clean kitchen towel until the cooking is complete. Dress with butter, sugar (white sugar is traditional), and lemon as you wish and then roll them up and tuck in.